The Conference Board’s Employment Trends Index – which forecasts employment for the next 6 months – again strengthened. The index has improved now for 11 months. However, the rate of growth slowed. The Conference Board believes future employment growth will likely be solid in the coming months – but Econintersect‘s own employment index is saying that economic pressures are continuing to grow but also is forecasting a slight deceleration in the employment growth rate within the next six months. 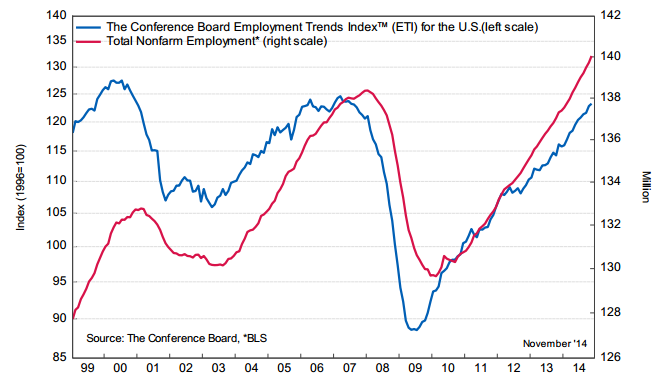 The Conference Board Employment Trends Index™ (ETI) increased in November. The index now stands at 123.24, up from 122.8 (a downward revision) in October. This represents a 6.1 percent gain in the ETI compared to a year ago. November’s increase in the ETI was driven by positive contributions from five of the eight components. In order from the largest positive contributor to the smallest, these were: Industrial Production, Ratio of Involuntarily Part-time to All Part-time Workers, Number of Temporary Employees, Real Manufacturing and Trade Sales, and Job Openings. To add context to this index, the following graph compares BLS non-farm payrolls, the Econintersect Employment Index, and The Conference Board ETI. Econintersectuses non-labor and mostly non-monetary economic pulse points in constructing its index, while The Conference Board uses mostly elements of employment data.